If anyone in the Green Stage crowd was worried about the deluge coming down leading up to Bloc Party's early evening set, it didn't show. And as the band took up their instruments, their always magnetic frontman, Kele Okereke, made certain of it. "We're not going to let a little rain screw up our fun, are we?" he called out to the colourful hordes of poncho-wearing and umbrella-toting stalwarts. As the banners on either side of the stage billowed threateningly, the Brits started the evening off with "Octopus," the first release from their upcoming Four, and as they moved into more familiar tunes, it became clear that Okereke's initial statement had understated things a bit. Instead of fleeing from the rain, the crowd continued to grow, stretching beyond the stage's grassy amphitheatre, the sea of hands waving in unison and passing along a series of soggy crowd surfers. 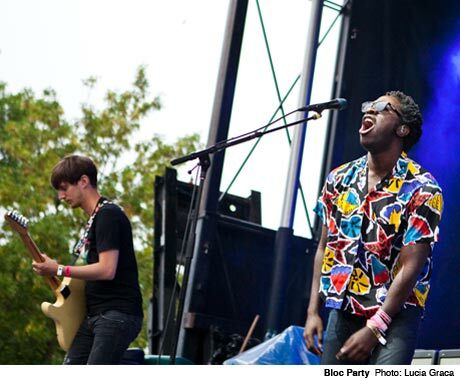 Throughout the performance, it became clear that Bloc Party's two-year hiatus has done nothing to dull the band's sound, or their fans' fervour, as each of their dance-rock standards added fuel to an already electrifying set. Bursting into their closing track, the buzzing intro to "Helicopter" sent the audience into a delighted frenzy, with Okereke having the soaked masses belt out the song's entire first verse. Sing-alongs don't get much more impressive than that.